Joe Posnanski makes the case for the Cleveland Spiders. So I wrote a column this week on why the Cleveland Indians should scrap their mascot, Chief Wahoo, and call themselves the Spiders. It was inspired in no small way by Joe Posnanski's 2007 blog post urging the Indians to do the same. Unfortunately, that post has been nearly archived out of existence, thanks to Joe's moving around to several different publications, including Sports Illustrated -- and that's a shame, because it really is a great,heartfelt plea to a city and team to do the right thing. So I'm reposting it here in the Bloggery so that more people can read it, and hopefully help preserve the piece. I'm sure if Joe knew his post was archived away, and knew that people still cared about it, he wouldn't mind us running it again. The Indians are one game away from the World Series, there's mayhem and excitement and so much to write about. But for some reason, I'm motivated tonight to write about Chief Wahoo. I wouldn't blame you for skipping this one … not many people seem to agree with me about how it's past time to get rid of this racist logo of my childhood. Cleveland has had an odd and somewhat comical history when it comes to sports nicknames. The football team is, of course, called the Browns, technically after the great Paul Brown, though Tom Hanks always says it's because everything Cleveland is brown. He has a point. You know, it was always hard to know exactly what you were supposed to do as a "Brown" fan. You could wear brown, of course, but that was pretty limiting. And then you would be standing in the stands, ready to do something, but what the hell does brown do (for you)? You supposed to pretend to be a UPS Truck? You supposed to mimic something brown (and boy does THAT bring up some disgusting possibilities?) I mean Brown is not a particularly active color. At least the Browns nickname makes some sort of Cleveland sense. The basketball team is called the Cavaliers, after 17th Century English Warriors who dressed nice. Perfect. The hockey team, first as a minor league team and then briefly in the NHL, was called the Barons for reasons that seem to be lost to history and logic. Another hockey team was called the Crusaders. Another hockey team was the Lumberjacks. You get the sense that at some point it was a big game to try and come up with the nickname that had the least to do with Cleveland. Nickname guy 1: How about Haberdashers? Nickname guy 2: No, we have some of those in Cleveland. Nickname guy 1: Polar Bears? Nickname guy 2: I think there are some at the Cleveland Zoo. Nickname guy 1: How about Crusaders? They're long dead. Cleveland's baseball nickname history has its own crazy history. The baseball team was, for a year in 1890, called the Cleveland Infants. My best guess is they were named that for 16-year-old pitcher Willie McGill, who won 11 games that season, but I don't know. Maybe they brought infants to the games. Maybe they had a deal where you could use your infant as a ticket into the game. In other years, the baseball teams were called the Blues, the Bronchos and, of course, the Spiders. We'll get back to the Spiders in a few minutes. Then, from 1903-1914, they were known as the Cleveland Naps. This was after the great Napoleon Lajoie, who signed with the team as a free agent in 1903. II'm guessing it was in the contract that they name the team after him; I'm surprised Roger Clemens didn't ask for this. Though Lajoie was a great player, you do have to admire a team that would name itself after a quick afternoon sleep. Then, in 1914, the Naps lost 102 games, and Lajoie hit .258, 80 points below his career average. He was 39 then and clearly done (he did play two more mostly ineffective years in Philadelphia), and so Cleveland needed a new nickname. You know what's coming. This is when legend and fact blur. The way I had always heard it growing up is that the team, needing a new nickname, went back into their history to honor an old Native American player named Louis Sockalexis. Sockalexis was, by most accounts, the first native American to play professional baseball. He had been quite a phenom in high school, and he developed into a a fairly mediocre and minor outfielder for the Spiders (he played just 94 games in three years). He did hit .338 his one good year and apparently (or at least I was told) he was beloved and respected by everybody. In this "respected-and-beloved" version, nobody ever mentions that Sockalexis may have ruined his career by jumping from the second-story window of a whorehouse. Or that he was an alcoholic. Still, in all versions of the story, Sockalexis had to deal with horrendous racism, terrible taunts, whoops from the crowd, and so on. He endured (sort of — at least until that second story window thing). So this version of the story goes that in 1915, less than two years after the tragic death of Louis Sockalexis, the baseball team named itself the "Indians" in his honor. That's how I heard it. And, because you will believe anything that you hear as a kid I believed it for a long while (I also believed for a long time that dinosaurs turned into oil — I still sort of believe it, I can't help it. Also that if you stare at the moon too long you will turn into a werewolf). In recent years, though, we find that this Sockalexis story might be a bit exaggerated or, more to the point, complete bullcrap. If you really think about it, the story never made much sense to begin with. Why exactly would people in Cleveland — this in a time when native Americans were generally viewed as subhuman in America — name their team after a relatively minor and certainly troubled outfielder? There seems to be some evidence now that the Indians were actually named that to capture some of the magic of the Native-American named Boston Braves, who had just had their Miracle Braves season (the Braves, incidentally, were not named AFTER any Native Americans but were rather named after a greasy politican named James Gaffney, who became team president and was apparently called the Brave of Tammany Hall). This version makes more sense, certainly. There's also a theory that the name was chosen by a fan contest in the newspapers and you KNOW they weren't honoring Louis Sockalexis. We do know for sure they were called the Indians in 1915, and (according to a story written by author and NYU Professor Jonathan Zimmerman) they were welcomed with the sort of sportswriting grace that would follow the Indians through the years: "We'll have the Indians on the warpath all the time, eager for scalps to dangle at their belts." Oh yes, we honor you Louis Sockalexis. What, however, makes a successful nickname? You got it: Winning. The Indians were successful pretty quickly. In 1916, they traded for an outfielder named Tris Speaker. That same year they picked up a pitcher named Stan Covaleski in what Baseball Reference calls "an unknown transaction." There need to be more of those. And the Indians also picked up a 26-year-old pitcher on waivers named Jim Bagby. Those three were the key forces in the Indians 1920 World Series championship. After that, they were the Indians to stay. Chief Wahoo, from what I can tell, was born much later. 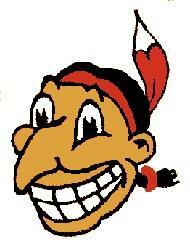 The first Chief Wahoo logo seems to have been drawn just after World War II. Until then, Cleveland wore hats with various kinds of Cs on them. In 1947, the first Chief Wahoo appears on a hat. He's got the yellow face, long nose, the freakish grin, the single feather behind his head … quite an honor for Sockalexis. As a friend of mine used to say, "It's surprising they didn't put a whiskey bottle right next to his head." Three years later, they changed the Wahoo logo — I suspect this is not because people thought it was racist (nobody really cared) but because they liked a newer, cleaner version of Wahoo. This new Wahoo was another grinning, slightly-smaller-nosed, one-feather Indian, only this time his face was all red. This is, more or less, the Chief Wahoo of today. This is also the Chief Wahoo I grew up with, though it should be said that there was a time during my childhood when the Indians seemed more or less embarrassed by Wahoo. I never thought this was because of any PC sensibilities — I think they Indians were just so bad they were looking for a new start wherever they could find one. They started going back to trying various Cs on hats throughout the 1960s and 1970s, including the unforgettable "Crooked C" blue and red catastrophe of 1975. I have to find one of those hats. Wahoo was around though — there was a giant Wahoo on Cleveland Municipal Stadium, you could see it from a half mile away. I know I wore lots of clothes with that grinning Wahoo on them. I had no problem doing that. I liked Wahoo. To me, he was funny. Then, that's the point, isn't it? You know, I remember once walking through the Holocaust Museum, and seeing all of these horrifying caricatures of Jews that they would give to kids in 1930s Germany. I looked at these things in horror for a long, long time. You know why? The logos themselves weren't so different from Wahoo. I'm not comparing anything but the style of logos — obviously, the Jewish caricatures were a billion-billion times more sinister. They were meant to raise an entire generation of Jew-haters. Wahoo is, I think, just a stupid sports logo. But — and this is the point — those logos, like Wahoo, were of real people only they were cartoony and goofy and exaggerated and meant to make a child laugh. They did not LOOK much different. Here's a newspaper quote you might enjoy, taken from the same article I mentioned earlier: "To insist that Native Americans be given equal rights with other citizens is one thing. To insist that their particular sensibilities entitle them to exercise a kind of sensorship is quite another." That's the argument for Wahoo, isn't it? The argument is that Native Americans are being too sensitive. What's the big deal anyway? Chief wahoo doesn't hurt anybody. Don't Native Americans have much bigger problems to deal with than a logo on a baseball cap? Wahoo has been around for a long time, we don't need censorship of our sports because a few Native Americans are marching, right? Trouble is, that quote wasn't about Native Americans. It was actually a quote taken from Washington Post in 1947, and you can replace "Native Americans" with Negroes. It was an editorial The Post wrote about how Little Black Sambo was a fun little storybook character, and anyone who took offense to this grinning, big-lipped abomination was just acting silly and politically correct. Symbols do matter. The funny thing is, everybody really does understand this on both sides of the argument. The Confederate Flag doesn't just matter to those who see it as a racist symbol. It also matters to those who put in on their trucks or state flags. Neo-Nazis spray paint swastikas on Synagogues — they know it matters. You could not put a Little Black Sambo statue on your front lawn and then say, "Oh, I just appreciate the artistry." Wahoo is an inherentry racist symbol. Nobody could really deny this. Nobody could look at that grinning mug and say, "No, it's really a flattering portrayal of Native Americans, who were conquered, nearly wiped off the planet by our ancestors and then forced to live on reservations." The thing is, I think so many of us were raised to think of Indians as cartoon characters, as movie villains, as the Native American who had a tear in his eye because people kept dumping garbage all over this great land, that we have become desensitized. I heard someone doing a comedy bit on XM Radio about Native Americans and casinos and alcohol and how nobody should care anyway because they lost the wars, and though I've heard similar bits (and I think I have pretty tough comedy constitution), this particular one was so cruel, so mean-spirited, so wrong, that I realized there was probably no other group in America someone could say such awful things about without drawing the Kramer backlash. The only reason Chief Wahoo is around is because Native Americans don't have a strong enough voice in this country to put a stop to it. When Native Americans protested at the 1997 World Series, they were mostly laughed at. Three were arrested. Is this really the kind of country we want to be? And for what? To stand up for our inherent rights to enjoy a racist sports logo? I love Cleveland. I love the Indians and I even love Wahoo in a weird way because it is such a part of my childhood. But it is not just time to get rid of Wahoo, it is way, way past time. I don't think this is the biggest problem facing the world, or even the 5,4993,287th biggest problem facing the world. I don't care about political correctness either. No. It's just wrong. Very wrong.Get rid of it. The fewer wrong things in the world, better. And it brings me all the way back to this … why can't we just go back to calling the team the Spiders. That's a great name, and it's not taken by anybody in major sports. There's history there. It actually fits Cleveland (believe me, there are more spiders in Cleveland than Native Americans — especially those creepy Daddy Long Legs that are like walking paperclips). And there are a million incredible logo and mascot possibilities. Even if they don't get rid of the Indians nickname (I think you might as well go all the way) it's definitely time to bury Wahoo. This would be a good year to make it happen. The Indians are a game away from the World Series. There is some real joy happening. There is some real excitement. The Indians have a real chance to end the longest citywide sports drought in American sports. There are a lot of good feelings in the Cleveland air. It would be a good time to bury a logo that should never have been born to begin with. You can read other, more recent columns and posts by Joe Posnanski online at Joe Blog.